"Admissions. Admission. Aren't there two sides to the word? And two opposing sides...It's what we let in, but it's also what we let out." Jean Hanff Korelitz was born and raised in New York and graduated from Dartmouth College and Clare College, Cambridge. She is the author of one book of poems, THE PROPERTIES OF BREATH, and three previous novels, A JURY OF HER PEERS, THE SABBATHDAY RIVER and THE WHITE ROSE, as well as a novel for children, INTERFERENCE POWDER. She has also published essays in the anthologies MODERN LOVE and BECAUSE I SAID SO, and in the magazines VOGUE, REAL SIMPLE, MORE, NEWSWEEK, ORGANIC STYLE, TRAVEL AND LEISURE (FAMILY) and others. She lives in Princeton, NJ with her husband (Irish poet Paul Muldoon, poetry editor at The New Yorker and Princeton poetry professor) and two children. I read this when it was first released with my book group and LOVED IT! Winner will be chosen by Random.org - Void Where Prohibited. This giveaway is sponsored by the publisher and TWO copies are available. I want to see this movie... I would love to read the book too.. 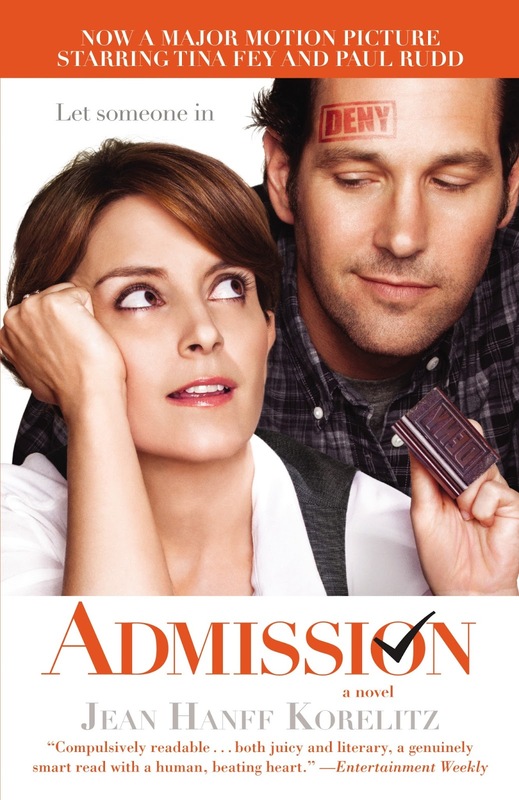 I woould love to win Admission! Secrets - past and present - make for such fascinating reading! Admission looks like a great book! I would love to read this. Entry for 3/19 - thanks! Entry for 3/20 - thanks! Entry for 3/21 - thanks! I think the book and the movie both sound good. Would love to win a copy of the book. Entry for 3/22 - thanks! Entry for 3/23 - thanks! Entry for 3/24 - thanks! Entry for 3/25 - thanks! Entry for 3/26 - thanks! Entry for 3/27 - thanks! Entry for 3/28 - thanks! Entry for 3/29 - thanks!